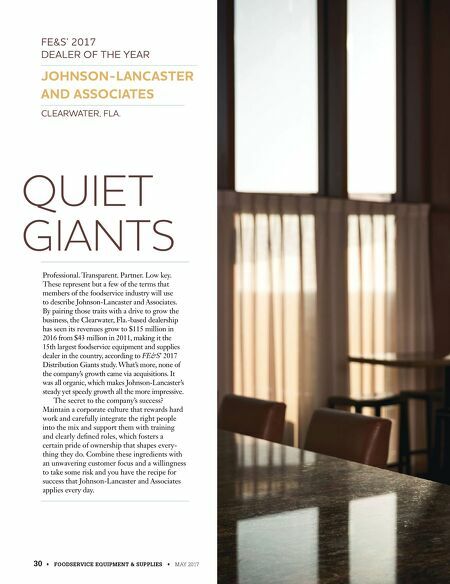 30 • FOODSERVICE EQUIPMENT & SUPPLIES • MAY 2017 QUIET GIANTS Professional. Transparent. Partner. Low key. These represent but a few of the terms that members of the foodservice industry will use to describe Johnson-Lancaster and Associates. 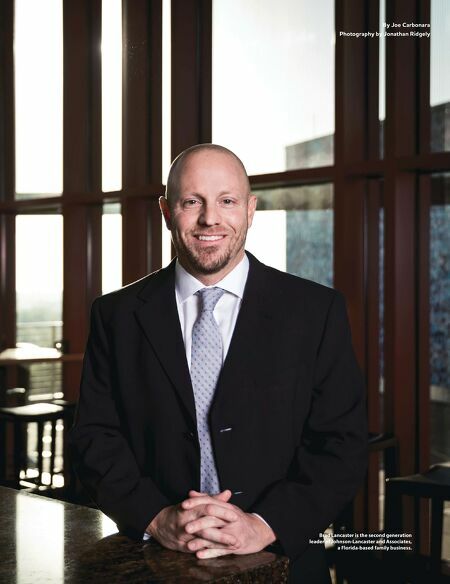 By pairing those traits with a drive to grow the business, the Clearwater, Fla.-based dealership has seen its revenues grow to $115 million in 2016 from $43 million in 2011, making it the 15th largest foodservice equipment and supplies dealer in the country, according to FE&S' 2017 Distribution Giants study. What's more, none of the company's growth came via acquisitions. It was all organic, which makes Johnson-Lancaster's steady yet speedy growth all the more impressive. The secret to the company's success? Maintain a corporate culture that rewards hard work and carefully integrate the right people into the mix and support them with training and clearly defined roles, which fosters a certain pride of ownership that shapes every- thing they do. Combine these ingredients with an unwavering customer focus and a willingness to take some risk and you have the recipe for success that Johnson-Lancaster and Associates applies every day. FE&S' 2017 DEALER OF THE YEAR JOHNSON-LANCASTER AND ASSOCIATES CLEARWATER, FLA.
DSR of the Month: Cliff Macbeth, Dealer Designer and Project Director, CMA Restaurant Supply and Design, Kirkland, Wash.